St Johnstone have signed centre-half Plamen Krachunov until the end of the season after a trial period. But former West Ham defender Julien Faubert is no longer training with Saints after the 32-year-old received other offers. Krachunov, 27, last played with Slavia Sofia in his native Bulgaria and could be involved against Partick Thistle on Tuesday, if clearance arrives in time. "My first impressions of the club are really positive," said Krachunov. "I believe I have come to a great place to play for a very good team which over the last few years has been one of the top teams in Scotland. "St Johnstone are a team who have qualified for Europe in the last four seasons and I will do what I can to help them qualify again." Talking to the club website, manager Tommy Wright said Krachunov is "very strong, quick and is a good passer of the ball". Earlier, Wright had explained the departure of France-born Martinique international Faubert. "Julien has had a couple of offers, I believe one in America and another offer," he said. "I fully understand why he has gone. Maybe warmer climates are more attractive." 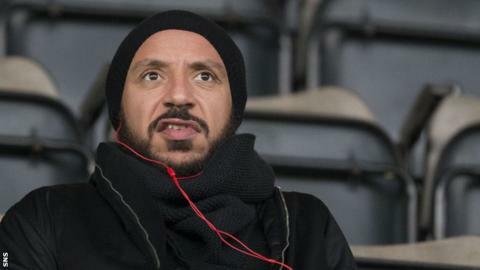 Faubert, who once had a loan spell with Real Madrid, watched St Johnstone beat Motherwell 2-1 in the Scottish Premiership on Saturday at McDiarmid Park. He is the second player to cut short a trial spell with the Perth club within a week. Nigerian defender Daniel Adejo, who left Greek Superleague club Kalloni in January, reportedly had an offer from a club in Serie B, where he previously performed for Reggina.